Brexit – How the Forum can help? Every employer has automatic enrolment duties. They need to assess their staff, put them into a workplace pension scheme if they meet certain criteria, write to them to tell them what they’ve done, and complete and submit a declaration of compliance with The Pensions Regulator (TPR). However, an employer’s workplace pension duties do not stop with declaring compliance. And with TPR conducting stop checks on employers across the country to make sure they are complying with their duties, it’s important you are aware what you need to do on a regular and ongoing basis to ensure you comply with the law. Research published by TPR shows the majority of employers do not have any difficulty with ongoing duties. The analysis shows that automatic enrolment is ‘business as usual’ for employers and that it’s easier than they thought it would be. Most micro employers said they spend around half an hour each month meeting their duties and two-thirds did not use outside help. Those who did say it cost them around £42 per month to use an accountant or auditor to help them. What are your ongoing duties? You need to calculate and pay the employer contributions to your staff’s pension scheme on an ongoing basis. In addition, you’ll need to calculate your staff contributions, make the necessary deductions from payroll and transfer their contributions to the pension scheme. You’ll have agreed what these rates are and when to pay them with your chosen pension scheme. By law, you and your staff have to make minimum contributions into the scheme, and you should be aware that these minimum contribution levels increased on 6 April 2018 and are due to increase again in April 2019 (see below). 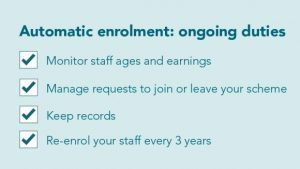 You will need to monitor any changes in age and earnings of your staff so that you can identify if they become eligible for automatic enrolment. You’ll also need to check the eligibility of any new members of staff on the day they start work. Should staff members become eligible (for example by turning 22, or by meeting the earnings thresholds), then you’re required to put them into a pension scheme and pay contributions to it. Your payroll software should be able to support you with this. Process requests to opt-in, join or leave the scheme, and keep and maintain accurate records. Opt-in/join: If any of your staff write to you asking to join your workplace pension scheme, you must put them into it within a month of receiving their request. You will have to pay into the pension scheme unless they are aged 16-74 and earn less than £503 a month or £116 per week. Opt-out: If any of your staff choose to leave your pension scheme within one month of being put into it, you need to stop taking money out of their pay and arrange a full refund of what has been paid to date. This must happen within one month of their request. Keeping records: You need to keep up-to-date records about your staff, including who you’ve enrolled and when, information about your pension scheme, and the contributions you are paying. You must keep these records for six years, except for requests to leave the pension scheme which must be kept for four years. Every three years, you’ll need to assess all your staff who either opted out of their workplace pension scheme or have ceased to become members, re-enrol them if they meet certain criteria, write to them to tell them what you’ve done – and then re-declare your compliance to The Pensions Regulator to let them know what you’ve done to meet your duties. Further information on ongoing duties can be found on The Pensions Regulator’s website.